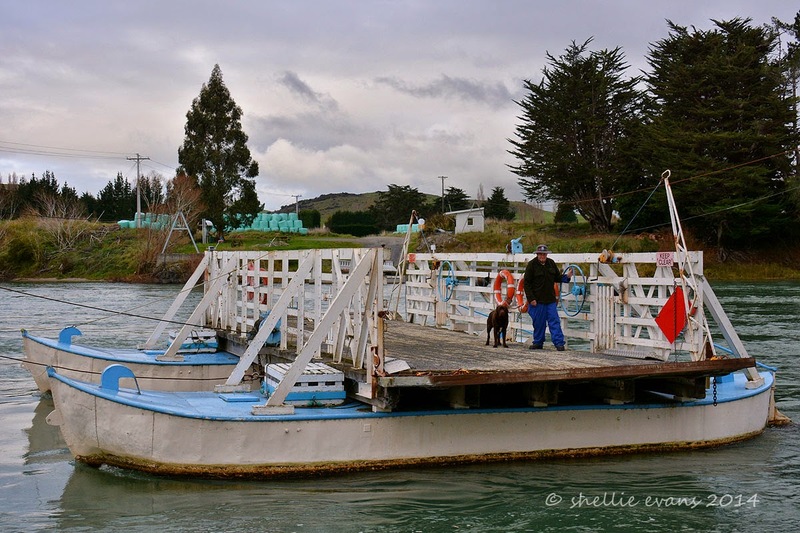 A punt that happens to be the last water driven public punt in the Southern Hemisphere. 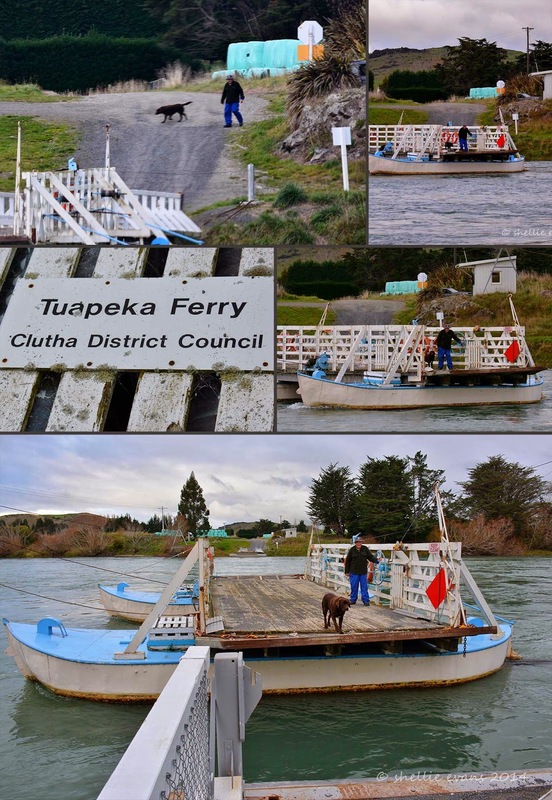 The historic Tuapeka Mouth punt has operated since 1896 carrying stock, carriages, people & cars across the Clutha River in South Otago. It runs daily from 8 to10am & 4 to 6pm and is now more a tourist attraction than a critical crossing of the river. Although it is part of the national roading system and as such there is no charge to use it, its maintained by Fulton & Hogan who also employ the puntmen. Most traffic uses the Clydevale Bridge which is 10 kilometres downstream. Flotation pontoons under the punt are manoeuvred by the puntman using the river's current & the water pressure against the rudders which are attached to the rear of the two hulls. Two heavy wire ropes are strung across the river, up-stream and down, which stop the punt from floating away. The puntman later told us that once when the river was in flood the water was higher than the cables which are about 3 metres above the water line. They remove the punt from the river when it’s in flood. We thought that we’d do a bit of exploring around Lawrence in the early afternoon and then drive the 30kms or so to the punt in time for when it opened at 4pm. 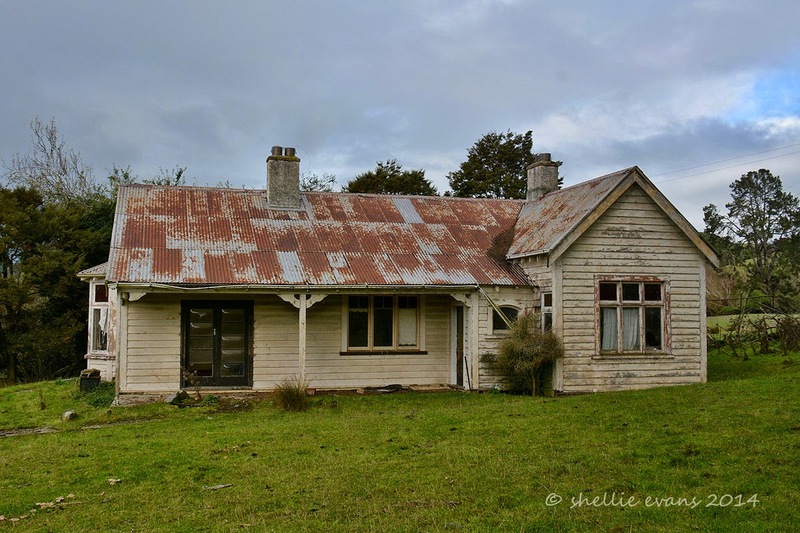 We finished exploring early and after taking a longer route over rolling farmland & via a gravel road, we still arrived in Tuapeka with an hour to spare. 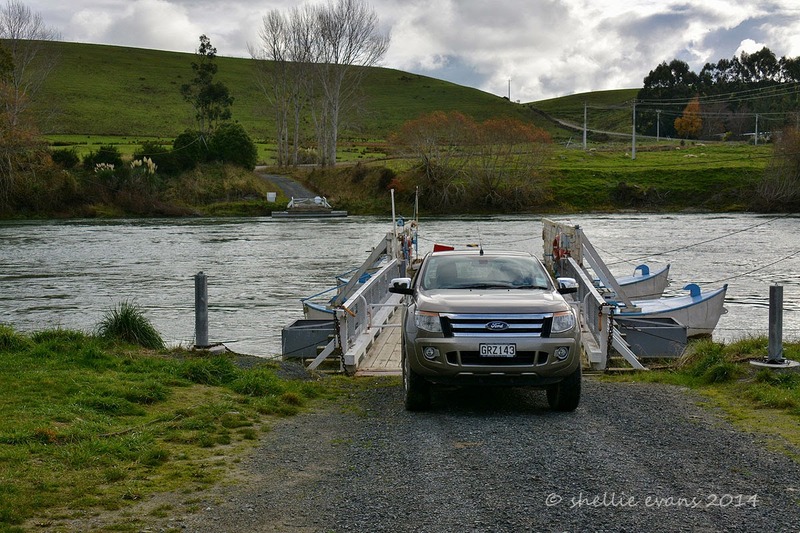 We had afternoon tea at the picnic table overlooking the punt, it was overcast & cold and we nearly decided to give the ride a miss and head for home. I took a photo of us “driving” off the punt just in case we didn’t return; you can’t see the chain at the back of the ute with the large STOP sign attached to it. In the end we thought we’d come this far we might as well wait until 4pm and catch the punt across the river. 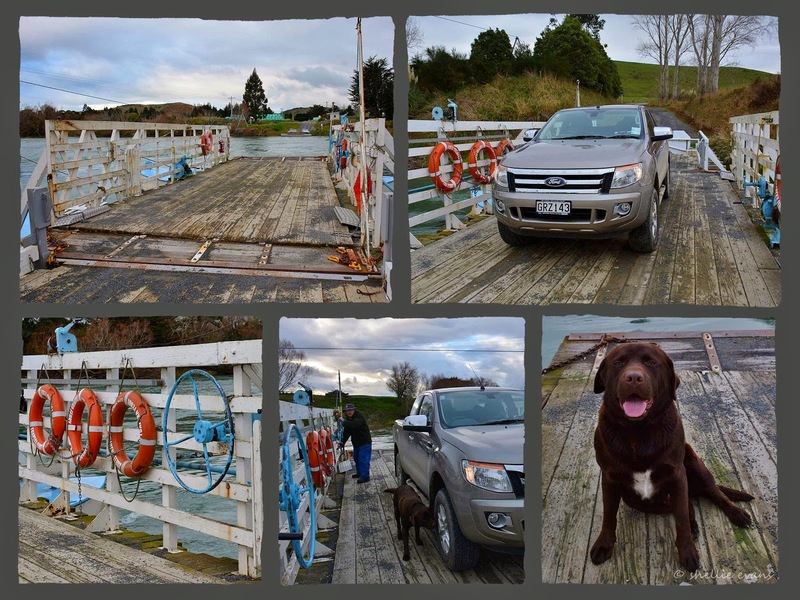 I also wanted to cross so I could add it to our tally of bridges or crossings that we’ve done over the Clutha River. To fill in time we decided we’d drive down to Clydevale, cross the river down there and drive up & catch the punt back from the other side. 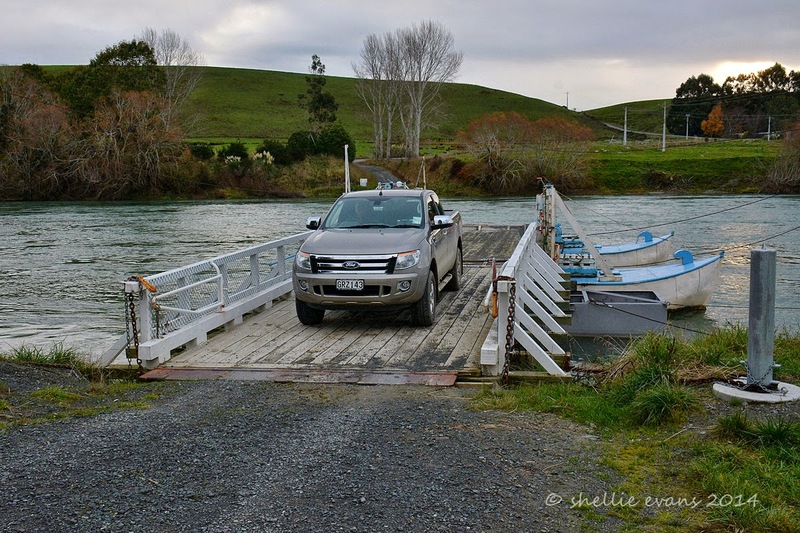 And here is a photo of the final bridge to complete my photo collection of Clutha River bridges, Clydevale Bridge (probably the least spectacular of them all as well). 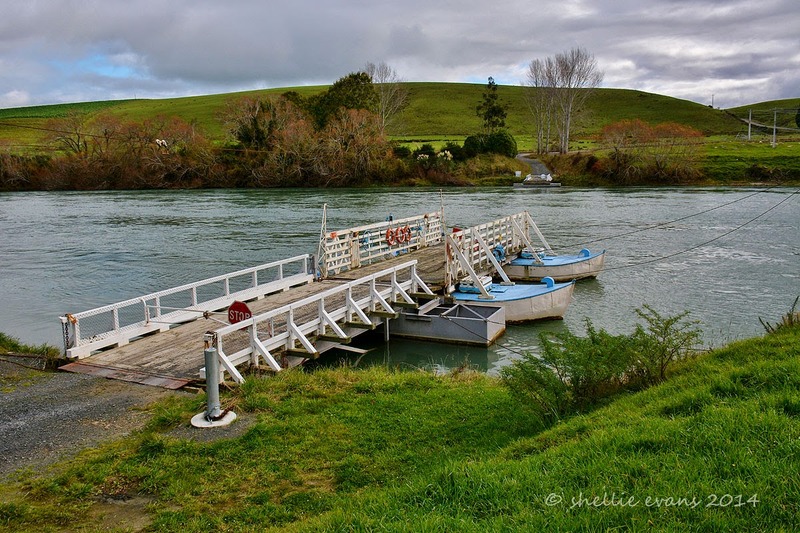 With just the punt crossing to do we will have driven, walked or been ferried across all of the Clutha River crossings from Albert Town near Lake Wanaka down to the Balclutha Bridge at Balclutha which we crossed way back at the beginning of our trip around the South Island. Clydevale was a “blink & you’ll miss it” kind of settlement so we drove up the river and past the punt, on towards some native forest that I spotted on the map. Maybe there was a walk we could do. 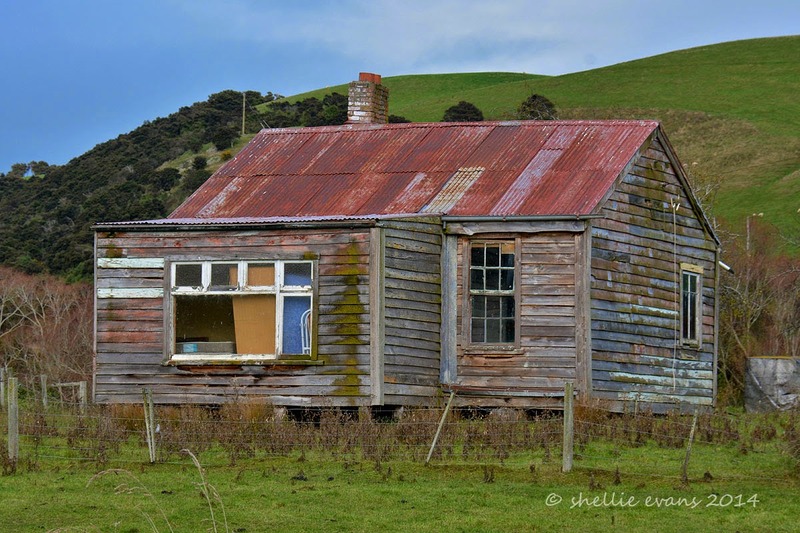 The road followed the river winding through farmland & passing a number of abandoned houses along the way. Standing beside this old abandoned farmhouse below, was a very large memorial to the men of the district who fought in WW1. I’ve noticed that there are many memorials around the countryside in the South Island, more so than in the North Island & most are quite elaborate and well looked after. This one is the Rongahere Memorial and was not so well tended, it was obviously positioned here overlooking the Clutha across the road but now looks like its in the front paddock of a farm. 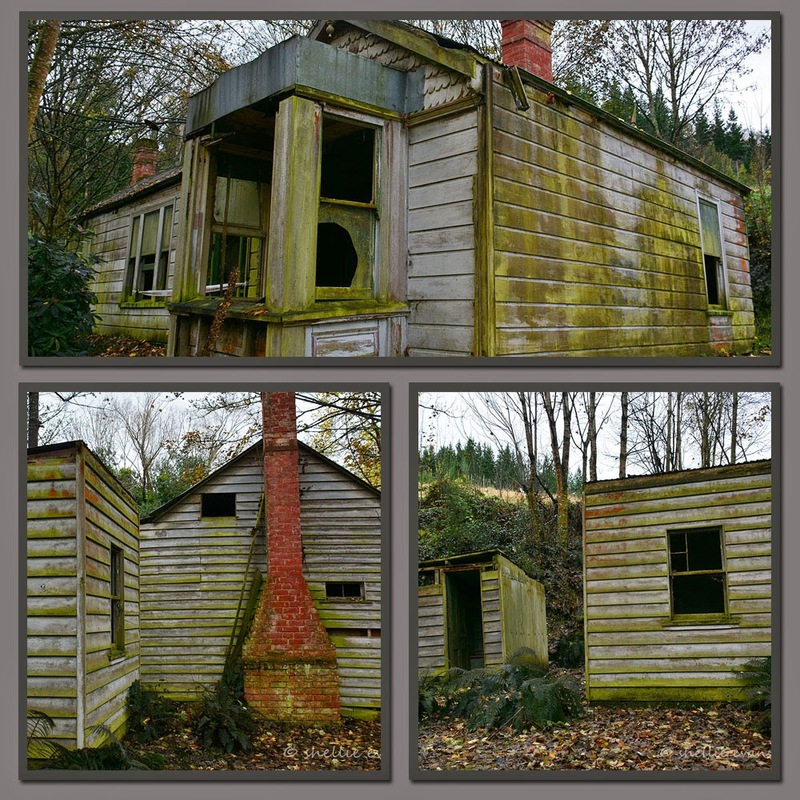 I’m sure this was once a well loved farm homestead, I wonder at the stories it could tell. A bit further down the road we found a walk, a “historic walk” the hand painted sign said. We’re not sure why its historic though. There was an information board with lots of newspaper clippings & photos but they were mostly faded & hard to read. It looked like it could have been a track across the Blue Mountains that Maori used to use. We walked a little way into the bush but it was dark, cold and uninviting & as it was getting near 4pm we decided to leave that one for another time. It would seem the walk was looked after by locals as someone had gone to all the trouble of doing the signboard & there were plastic tables & chairs to sit at in a clearing to the side & look at that bridge over a rock slip, that ain’t no DOC bridge for sure. We arrived back at the punt just after 4pm and saw that the puntman had arrived but was sheltering inside his hut. There wasn’t a sign on this side but we saw one on the other that said to toot your horn to alert him to your presence. We felt a bit awkward about that and waited about 5 minutes for him to spot us. 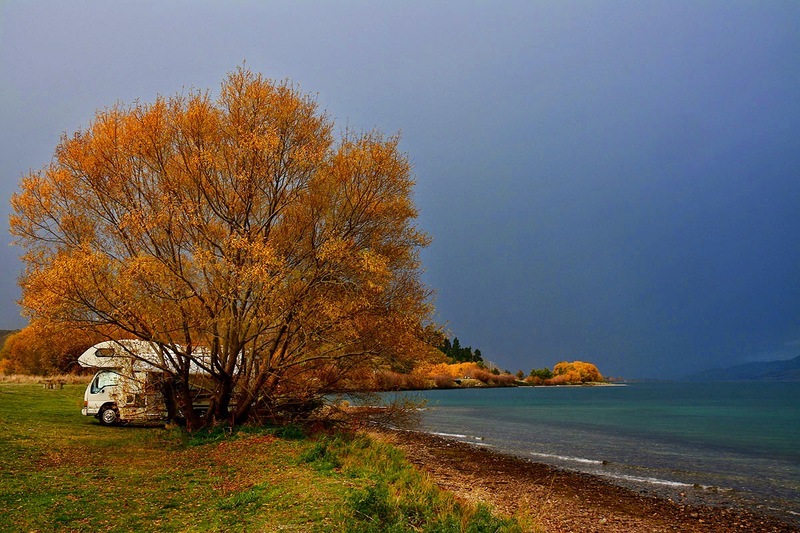 When I had looked through the window of the hut I saw that there was a mirror strategically placed high up on the wall opposite an easy chair which was facing away from the river. Anyone sitting in the chair just had to look up at the mirror to see if there was a vehicle waiting on the other side. This day Mr Puntman was not sitting in his chair. In the end we gave a toot. And then it was all action stations. A big chocolate lab came roaring out the door barking his head off, ran down to the punt & back up to meet an elderly gentleman who was now coming at a fast pace down the drive. Once on the punt the dog kept a watchful eye on us from beside his master & then moved to the end of the ramp as it got closer. When there was just a small gap between the ramp & us the dog leapt off and disappeared up the road behind sniffing and lifting his leg at every opportunity. Meet Peter Dickson (79) & his faithful mate Roy, Peter is only number 13 in a short line of Tuapeka puntmen that have been manoeuvring the punt across the river since 1896. He has been crossing this stretch of water for the last 20 years; he comes to the river twice a day, 5 days a week and thoroughly enjoys his job. Another puntman does the weekends. Peter is full of stories and tells me as I’m clicking away that he is more photographed than the Prime Minister. 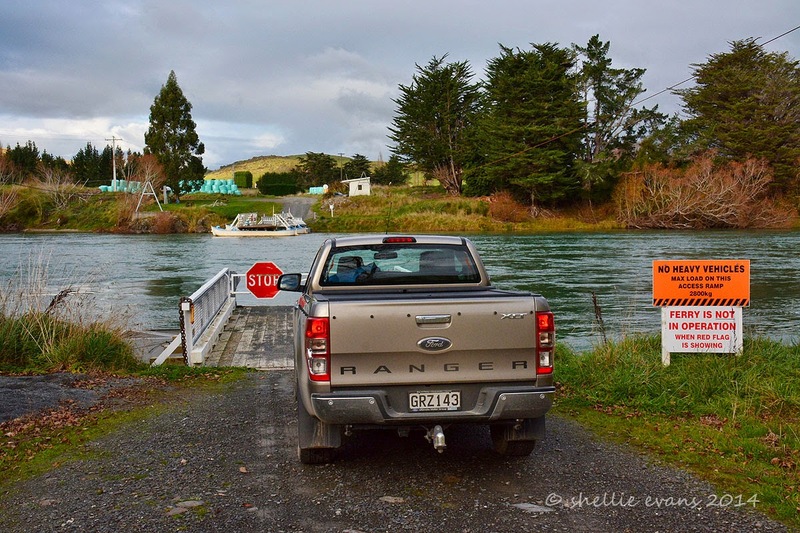 He shouts at Roy to get back on board after David has driven the ute onto the punt. Roy is more interested in something smelly in the long grass. With a last loud shout at Roy we pull away from the loading deck just as Roy bounds back down and jumps across the widening gap. Roy knows the drill; check the road out first and then you’ll have time to sniff the vehicle on the way across. Along with the passengers. He sticks his nose where the sun don’t shine, he is rather cute & a friendly brute as he pushes past me when Peter tells him off. I make him sit for a photo & he thinks that’s an invitation to be best mates. He’s wet & he stinks to high heaven, a combination of whatever he found up on the road and the wet fur from his duck shooting outing earlier in the day. Peter tells us that the winter is quiet and he might only get 1-3 vehicles in a day but during summer he can’t keep up. He doesn’t mind as long as the pay cheque keeps arriving, he can’t imagine not doing it. There has been times when the Clydevale Bridge has been shut and the punt has worked solid for weeks on end, then they’ve had to get in others to help out. After just 4 minutes and about 130 metres we arrive back on the other side, I walk off & up the bank to take some photos while David talks to Peter. Roy thinks it’s time to play & nearly knocks me flying as I scramble up the bank. This time I take a legitimate photo of the ute coming off the punt and I can add the final crossing of the Clutha to my file. The Bluff Oyster Festival started off well and good; blue sky & sunshine with just a chilly breeze to remind us that this was Bluff after all, Bluff at the bottom of the South Island, Bluff in the middle of May with winter fast approaching, Bluff on the edge of the Antarctic & don’t you forget it! But that was fine we went prepared, rugged up with jackets, hats, boots & scarves, & we went early. The occupants of this van had high hopes too. 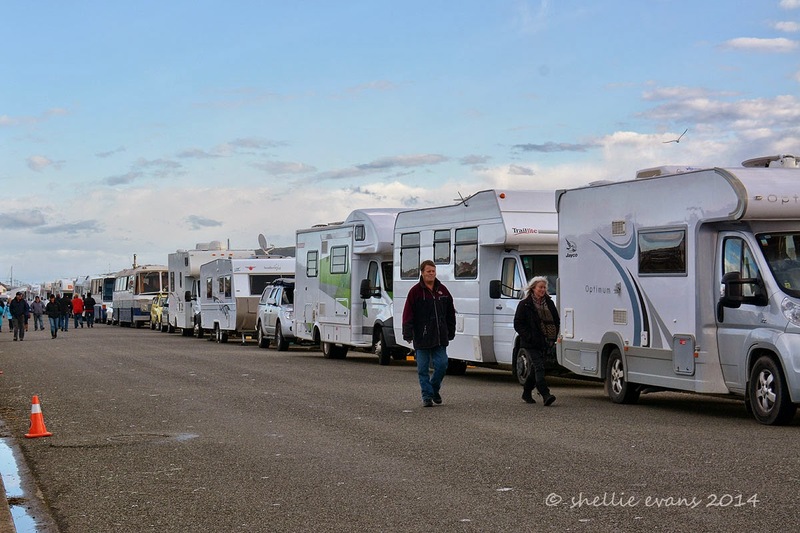 Dozens of motorhomes, buses & caravans had overnighted along the harbour edge near the venue, the local camp ground was overflowing with RVs too. 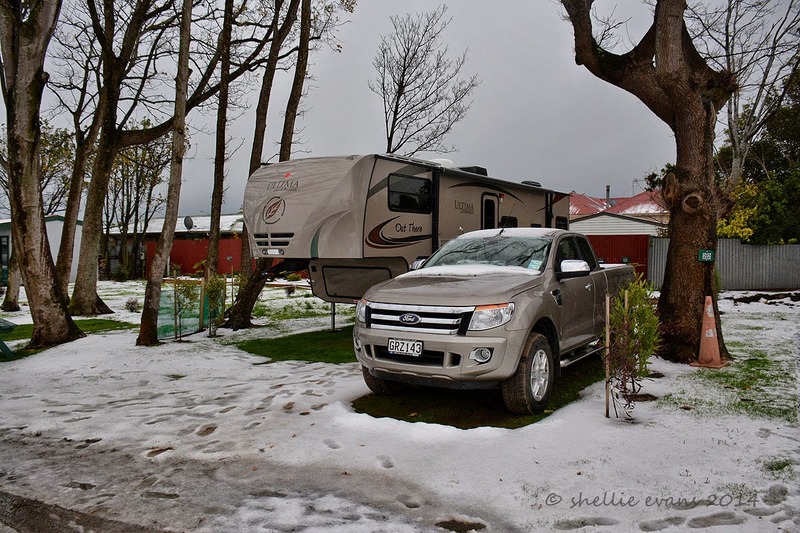 We stayed on in Invercargill, initially we were going to catch the festival bus to Bluff but instead we took the rental car my two girlfriends had arrived in. They had flown down from Tauranga to see me & to attend the Oyster Festival. 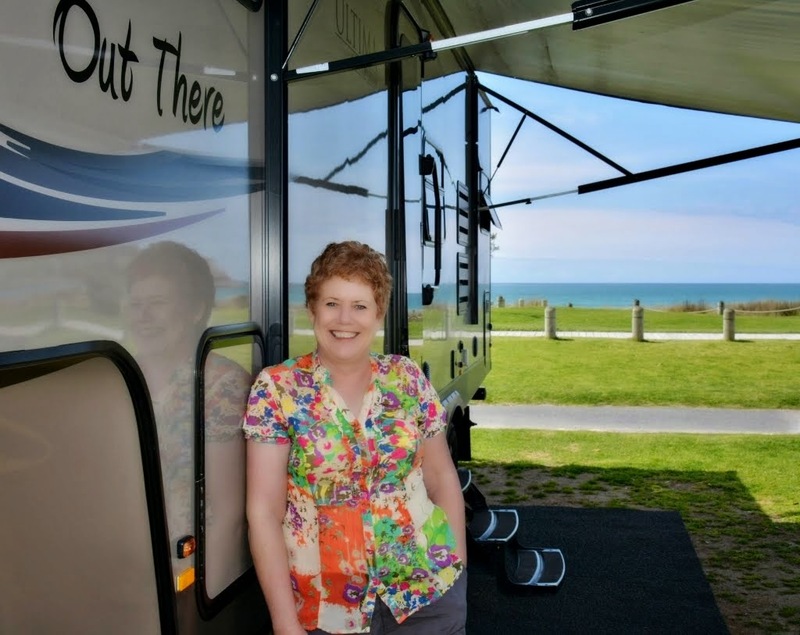 We met many people in motorhomes at our camp site and also people sitting with us in the marquee who had made a special trip to the festival, most of them from the North Island. And most spending a tidy sum on flights, accommodation & rentals. Puffer jackets and boots reigned supreme inside the festival. I’m sure the size of the crowd appeared double what it was, it was wall-to-wall puffer jackets; dozens of people looking like Michelin men, bouncing off each other in their “fat suits” as they squeezed through the crowds and past the queues for food. We started early. This was fortunate as it turned out. And, well, there was nothing else to do but sample the wares so we did. We’d also heard they had run out of some items in previous years. First up of course were Bluff Oysters, arguably the best darn oysters in the world, tasting like they had just been hauled out of the ferocious Foveaux Strait that very morning. We had them in the shell & then battered, I only wished I’d brought along a small bottle of balsamic vinegar to slurp them down with. Oysters were followed by scallops, then prawns and then a wee break to refill our wine glasses and contemplate what would be next on the menu. Whitebait fritters were up next and with a queue a mile long I had plenty of time to watch the fast approaching band of dark foreboding cloud in the distance. The wind was picking up and there was the odd spot of rain. The wind was also playing havoc with the gas BBQs the fritters were being cooked on. 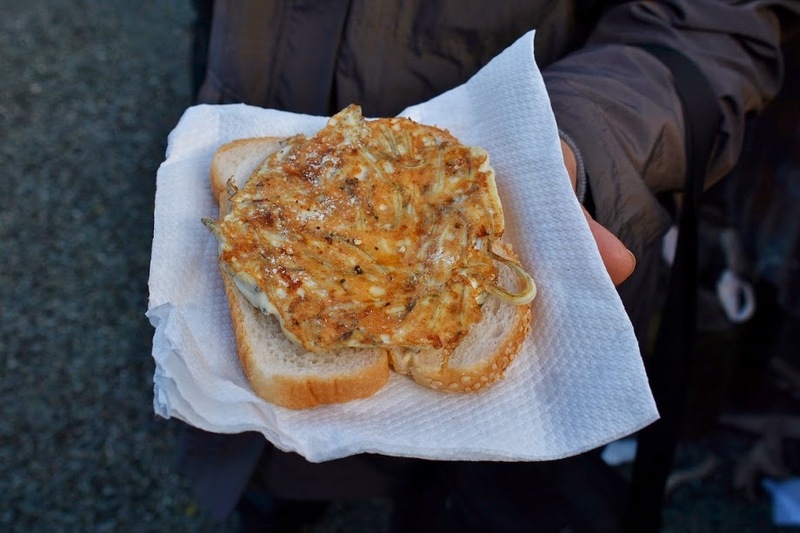 I shifted queues in time to get four well cooked fritters full of tasty whitebait, people behind me weren’t so lucky. One of the BBQs died & the queue size doubled. The girl behind the counter told me the crew had driven over from the West Coast the day before, it had been an epic 17 hour journey. They’d got half way over Arthur’s Pass when they were stopped by a massive slip that had come down, they had to retrace their steps and cross over via Lewis Pass and then drive all the way down to Bluff. Now it looked like they were going to be caught out again by the weather. I did learn one thing about whitebait fritters while I waited, they go well with mint sauce! I kid you not. Mint sauce! The stall had a bottle of mint sauce with the lemons & salt etc and suggested just a dribble around the edges of the fritter, not too much just a hint to compliment the whitebait. And it tasted great. I must remember that next time I have whitebait. 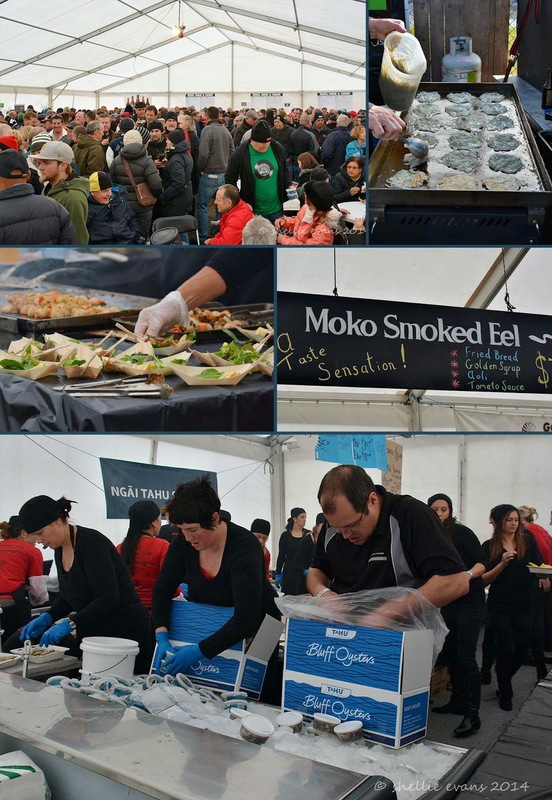 After the fritters and before the rain became torrential I braved the outside one more time to get some smoked eel & blue cod from another tent on the other side of the venue. I also bought a couple of pottles of Bluff Oysters to take home. And it was just as well I did because that was the last of the food to be had. As I was making a dash across the tarseal to our tent the full force of the storm hit. 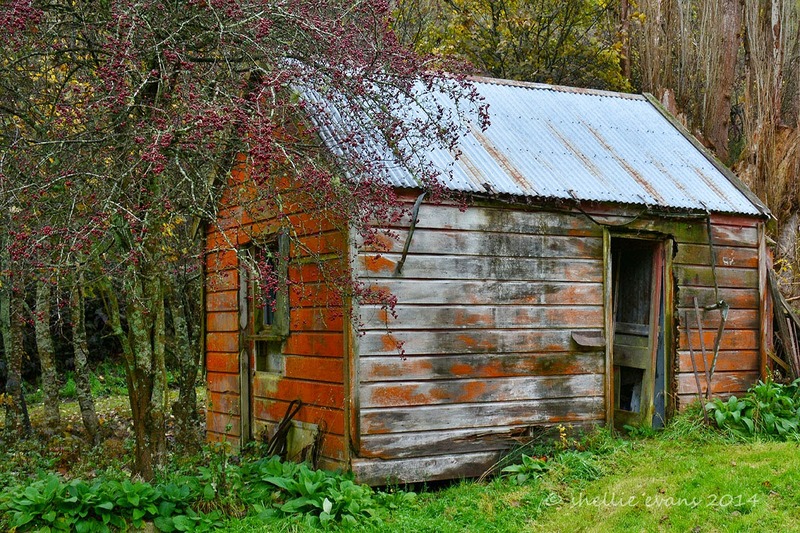 The whitebait tent was blown to smithereens, metal tables & plastic chairs hurtled past me, the band gear on the stage tumbled over the edge or was blown into the back of the canvas. People were being knocked over, others were clutching children or food & other gear off their stands. The port-a-loos that weren’t tied to the fence danced off down the tarseal. Chaos reigned. I managed to fight my way through the now solid body of people sheltering from the weather in our marquee & back to our table where I found the others looking very worried & concerned. The huge marquee was straining under the force of the wind, the metal support frame lifting, then banging & crashing down, the noise was deafening as the canvas strained against the gale force wind. After about 20 minutes and just as splits started opening up on the roof and walls of the marquee the call went out to evacuate via the far end of the tent. A wave of people started moving in an orderly fashion towards the opening at the end and into the full force of a ferocious storm. Organisers & volunteers were desperately trying to hold down other tents and gear, the fence had been opened up so we could get back to the carpark but it was a tough battle walking against the horizontal head wind. Many people were having to take shelter behind buildings & vehicles as they just couldn’t walk against the wind & stinging rain. David had to hold tight to one of my girlfriends (she is tiny) for fear she would be blown away. 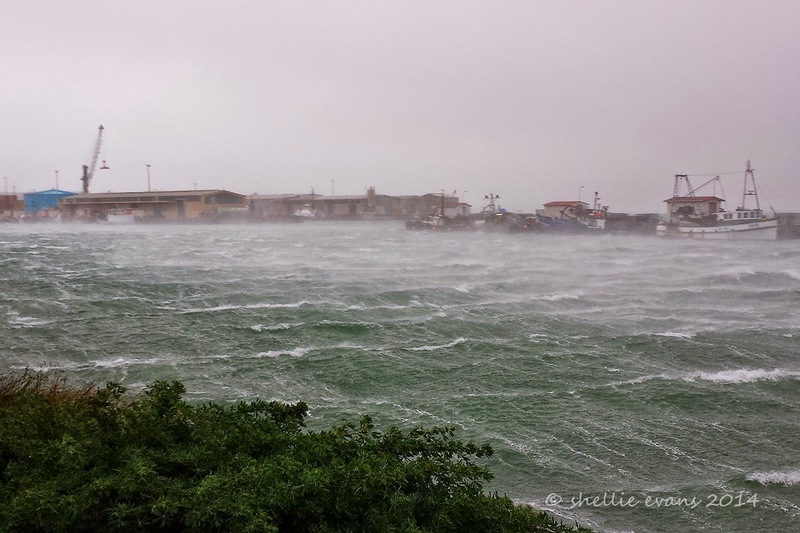 The sea spray was being whipped up across Bluff harbour with the fishing fleet jumping & bucking against their ropes. Thank God we had the car otherwise we’d have had to wait for the buses to arrive from town and there would have been a huge queue & no shelter. And then to cap off the dramatic end to the Bluff Oyster Festival, we were stuck in our car for nearly two hours in a traffic jam on the one and only road out of Bluff. The storm had blown power lines onto a passing vehicle and stopped traffic dead in its tracks in both directions. 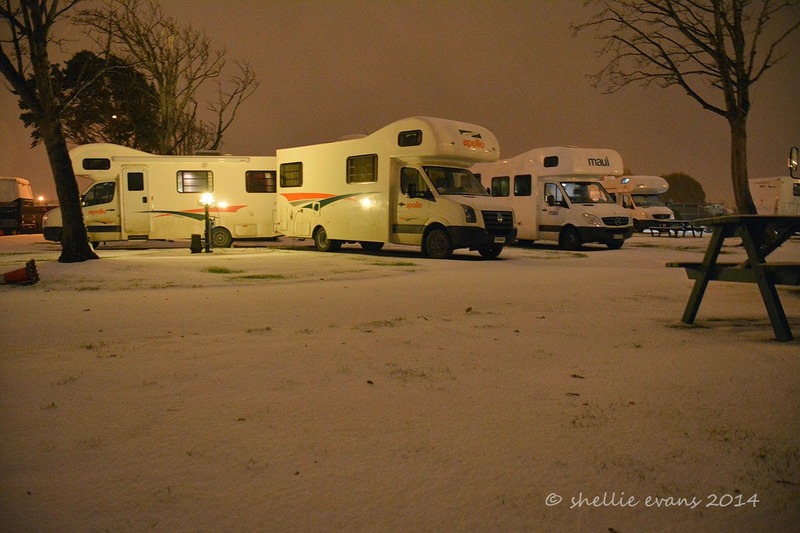 Finally we arrived home safe & sound & with a lull in the storm. 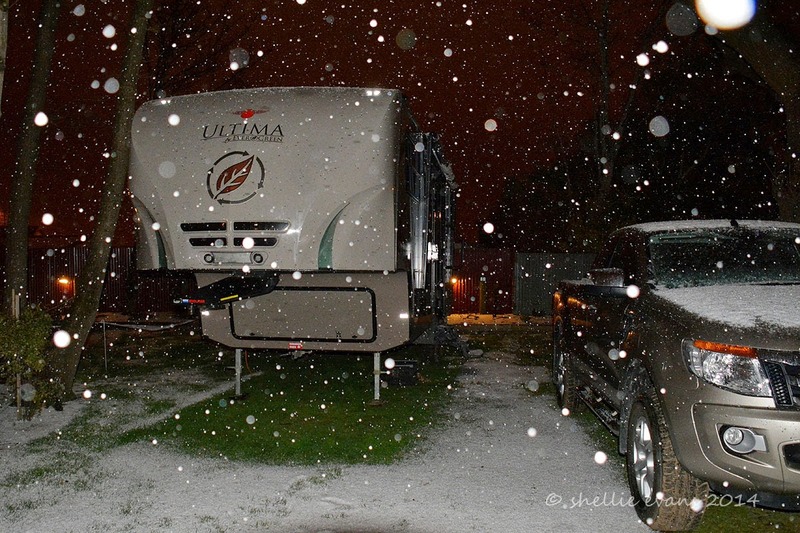 Then at around 9pm with thunder & lightning crashing & flashing directly above us the heavens opened up & dumped more hail than I’ve seen in my lifetime on top of us. It was amazing, it just kept coming, thick & fast covering everything in sight. I want to say it was snow but it was definitely hail, the solid little balls of ice finding their way down my neck and coating my head while I was out taking photos. In my slippers. You’ve got to seize the opportunity you know, the hail might have stopped while I was looking for my gumboots. Some of these photos were taken with a longer exposure hence the brightness, I should have got my tripod out and steadied the camera more but I was in a hurry. Mind you it was very eerie outside after the hail stopped, the white was reflected back into the sky and it was very bright outside, like dull daylight instead of the black night it had been earlier. 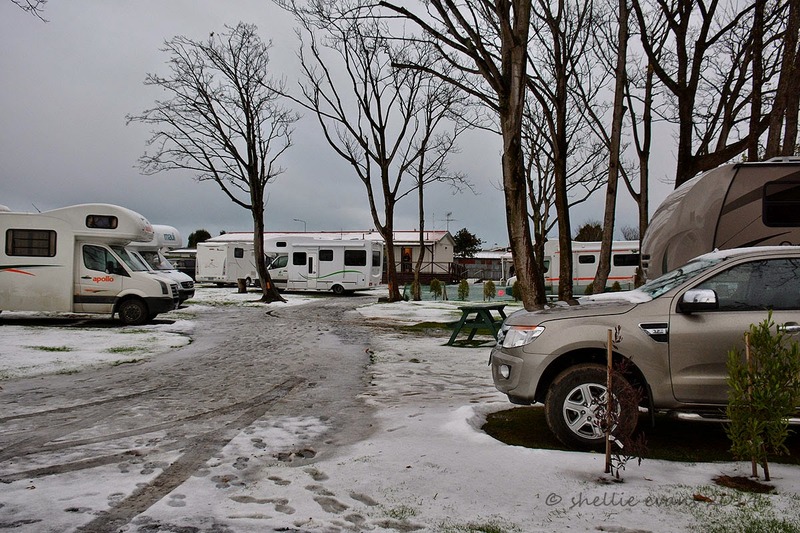 This post shows you what we woke up to this morning, ice, slush & now mud everywhere. Poor Doug (our camp ground host); his busiest weekend of the year obliterated by the worst weekend of weather he has ever experienced. 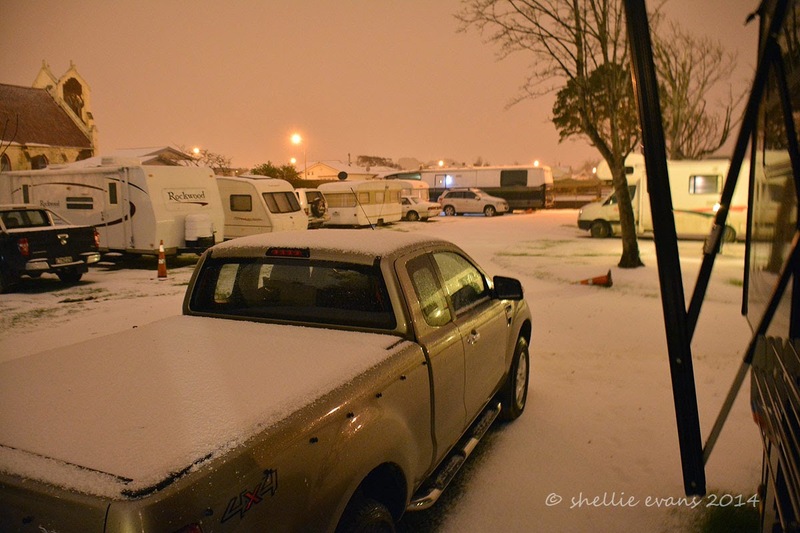 And still the storm rages outside 24hrs on, we have had horrendous winds, rain & hail on and off all day with snow predicted this evening. 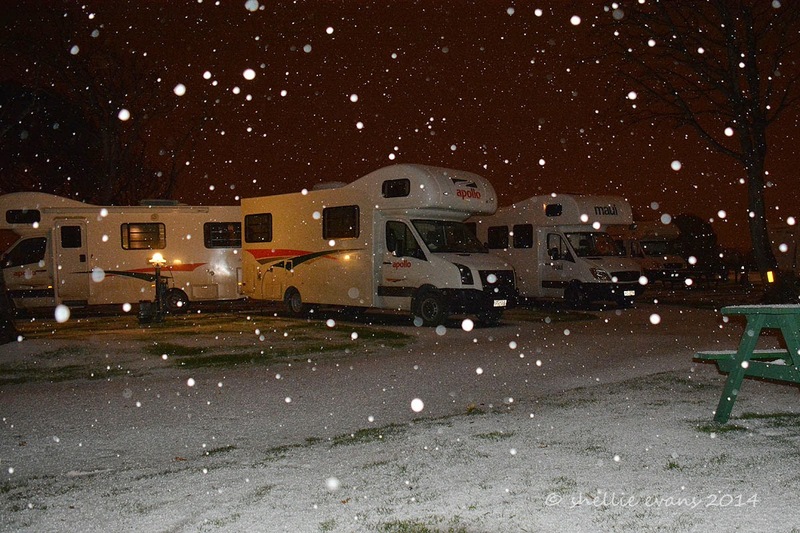 Our diesel heaters are working over time & we’re toasty warm tucked up inside our cosy home on wheels. And at least we have power and no need to move for a week or more. 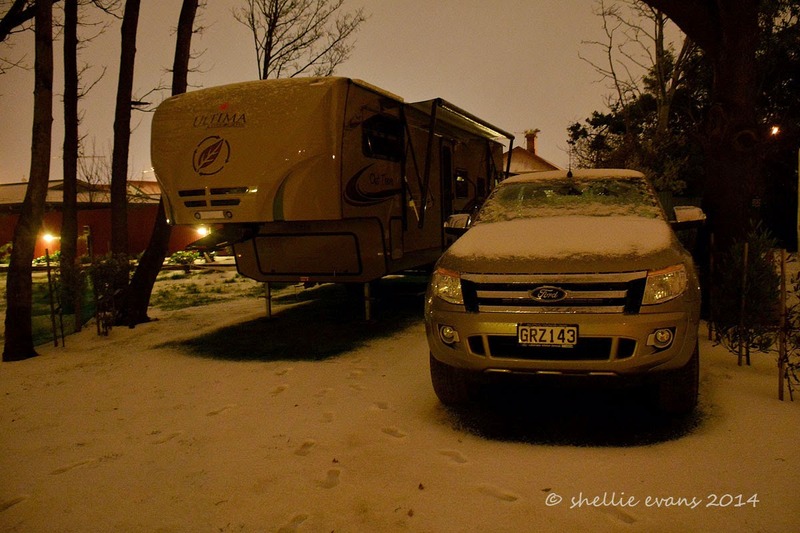 Life on the road is certainly bringing with it a wide range of experiences. 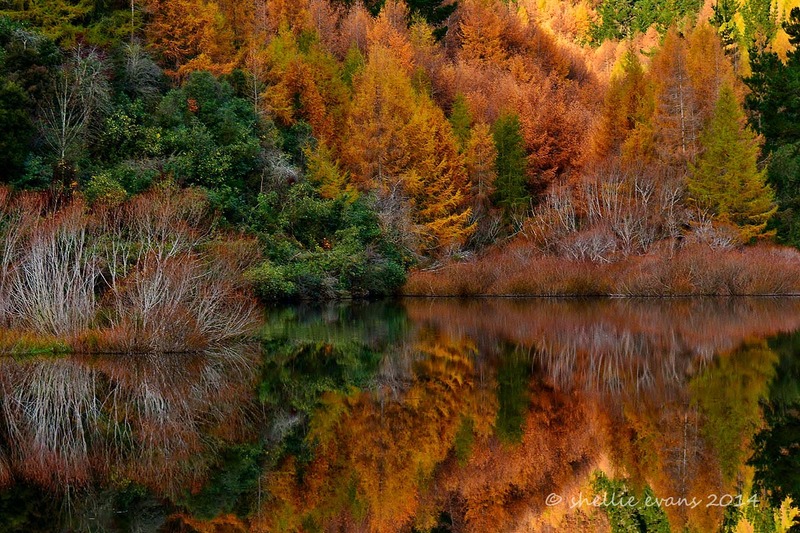 Our run to the top of the South Island to escape winter that is! After evacuating the Bluff Oyster Festival when a severe storm hit the venue (more on that soon in another blog post) the evening brought more excitement when the loudest, heaviest thunderclap I have ever heard rattled “Out There” (I’m sure the van was lifted off the ground & if it didn’t then it definitely lifted David & I off our seats!) And after the thunder & lightning came the hail, buckets & buckets of it. 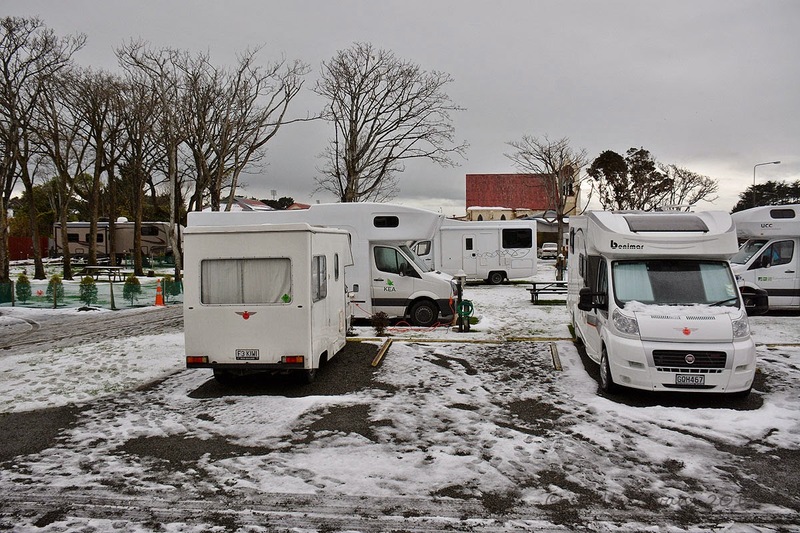 And this is what we woke up to this morning at City Central Camping Park in downtown Invercargill, a winter wonderland! You’ll remember this photo from the last post and me jokingly saying "I wonder where the lion escaped to…." …….the lion cage did indeed house a couple of lions - Sultan and Sonia. They escaped from a circus in Lawrence in 1978 and sadly were both shot for their troubles. The circus owner donated their bodies to the Otago Museum in Dunedin and they can be seen in their fully stuffed glory in the Animal Attic on the top floor. Well worth a visit and the most popular animals up there. How extraordinary, I don’t recall the event at all so I goggled to find out more about it. I found a lady who has written a book on the “Lawrence Lions” and sent her an email to see if she could throw any more light on the cage. It wasn’t that I didn’t believe you Lisa, I just thought the cage was rather small to house two lions and thought it may have been used in some sort of promotion to do with the circus. She responded within the hour. Clare’s blog link is at the bottom of the reply but also click on this link from her blog to read other’s accounts of the night the lions escaped, they are very interesting especially the guy who carted the dead lions off in his van to be taxidermied. 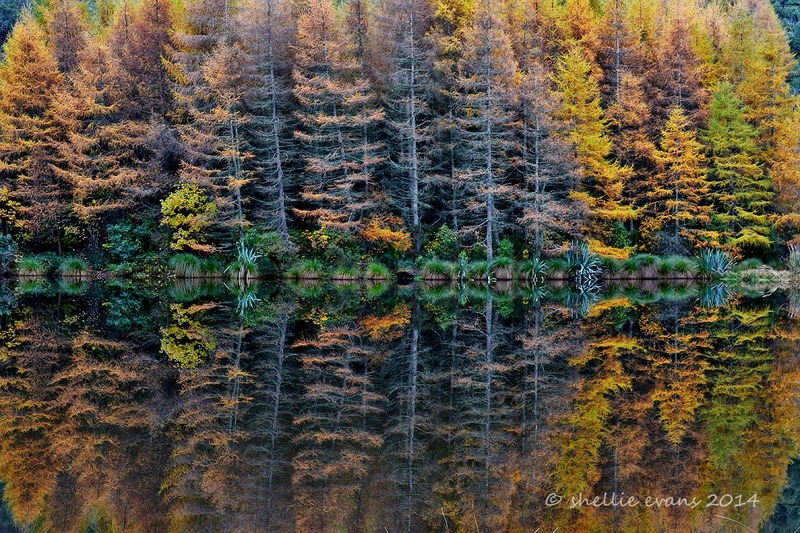 Hi Shellie I love your blog, the photos of Lawrence are lovely. 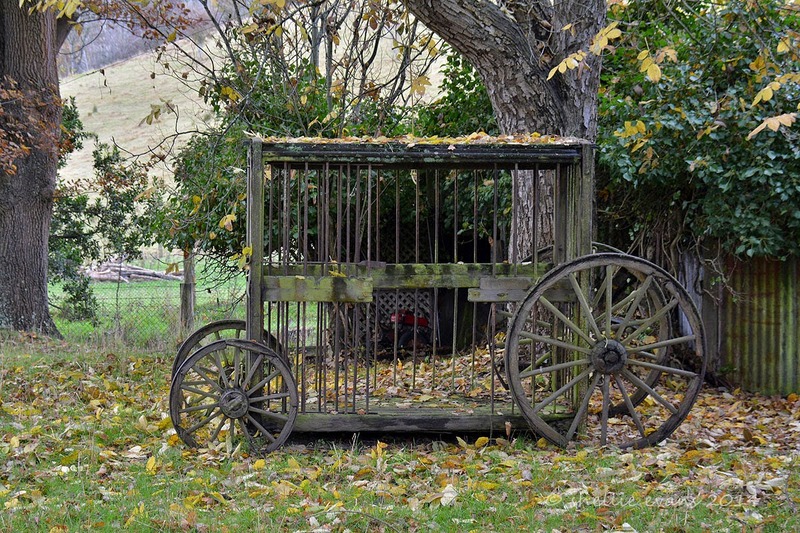 The cage at Wetherstones hasn't any connection to the Lawrence Lions, but as you can imagine it does sometimes add to the intrigue of the story. The Lawrence Lions escaped from the circus in 1978 when the circus was visiting Lawrence. The circus simply travelled to Lawrence in trucks. I published the children's picture book 'The Lawrence Lions' in 2012 and it has been a popular choice with tourists and locals alike. I also have a blog that tells the story of the Lions. Sultan and Sonia, the Museum’s famous Lawrence Lions, escaped from Carlos’ Circus on 30 March 1978. At the time, the travelling circus was entertaining a crowd of 400 people in Lawrence, Central Otago. After their cage was mistakenly left unbolted, Sultan and Sonia made their break for freedom just as the evening show began. In the chaos that followed, a six-year-old boy was scratched on the face by Sonia, the fleeing lioness. On leaving the circus grounds, Sultan and Sonia wandered towards an adjacent field where a local rugby team was practising, before making their way back to the circus. Three-year-old Sultan, the male lion, tried to return to his cage but couldn’t get in. He was then shot by the local constable because of fears for public safety, a decision endorsed by the manager of Carlos’ Circus. Sonia was eventually corralled in a local resident’s garage. Unfortunately, she escaped through the back door before she could be captured and was later found in the hospital grounds. After two failed attempts to tranquilise her, she too was shot. So there you go, truth is sometimes stranger than fiction. Thanks Lisa for sending me down the path to find out more & thanks Clare for filling in the gaps & keeping the story of the Lawrence Lions alive for future generations. 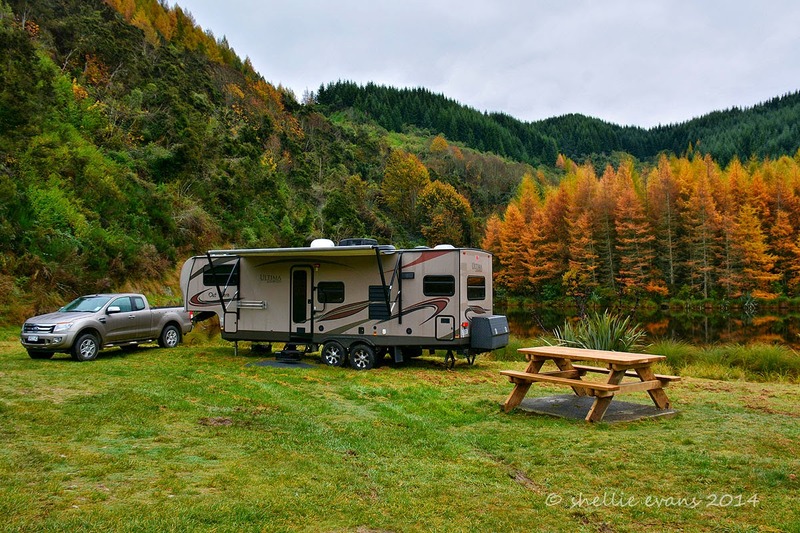 I got a bit ahead of myself with all the excitement of the Oyster Festival & the storm so I’m now stepping back a week or so to catch up on the blogs I missed from our last camping site at Grays Dam, Gabriel's Gully in Lawrence. 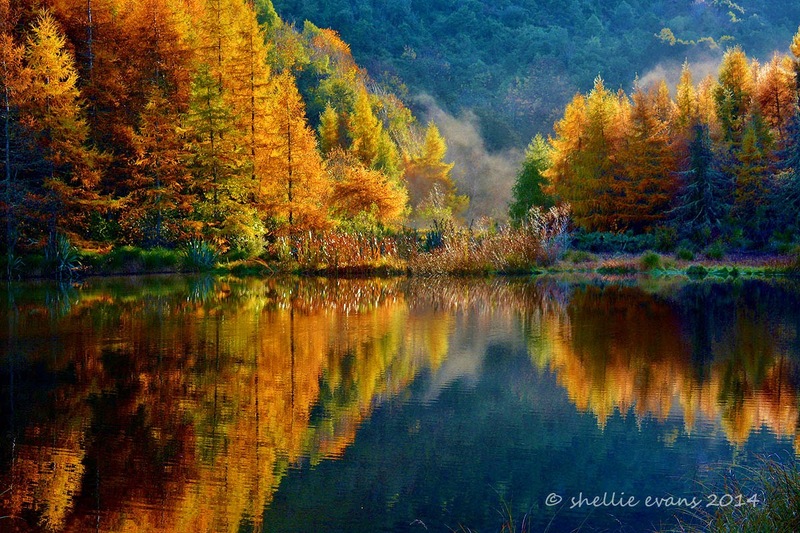 What a beautiful spot, it was very pretty with the trees at the end of their autumn colours & the grasses & reeds reaching right down to the pond’s edge. It was a quite a small pond with just a few water fowl making it their home; a pair of coots, a couple of shags, a few welcome swallows and a lone female paradise duck that kept me awake for most of the first night. She was calling for her partner and I felt very sad for her, David found some fresh empty cartridge cases on the ground & we can only assume that her mate was shot by some lazy scumbag who couldn’t be bothered driving out of town to a legitimate place to go duck shooting. Unlike other ducks, Paradise pair for life & she was calling for him all night & all the next day. Female paradise also have very loud calls. At one stage another pair flew in, the male ahead of his mate and the pond female got all excited doing a head bobbing swim all around him. Until the other female landed when all hell broke loose. After a good scrap between the females the other pair flew off & our female resumed her calls. 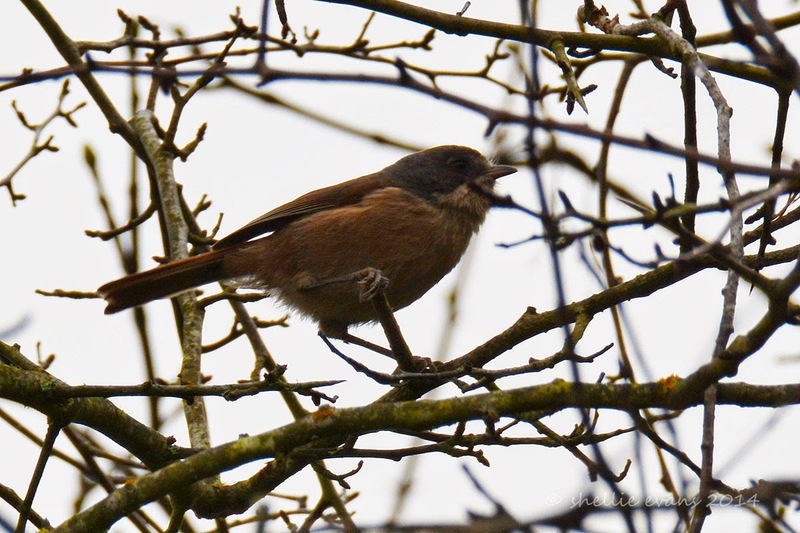 It was with great relief when I got up on the third day to see that overnight a lone male had flown in and taken up residence with the female. She looked very happy swimming around the edge showing her new mate the best places to feed. Peace was restored to the pond. 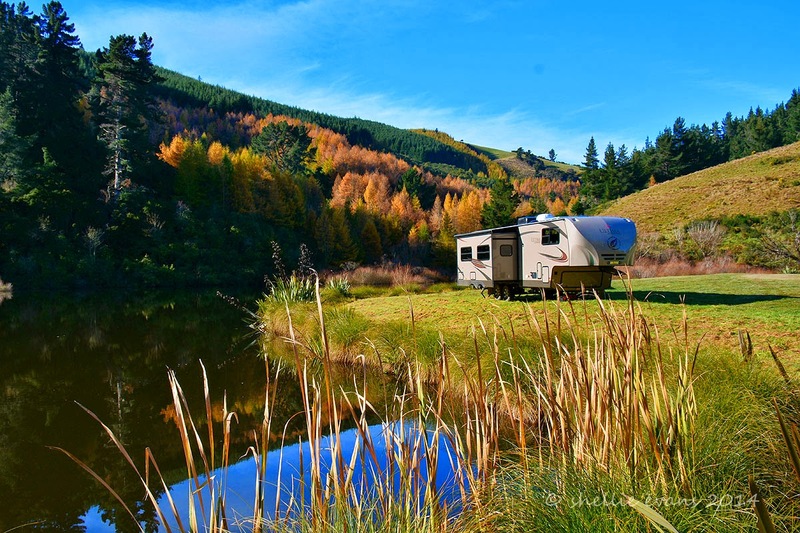 Other than the quacking duck it was a very peaceful spot, we stayed for 3 nights and on each there were 2-3 other RVs sharing the clearing at the end of the track with us. 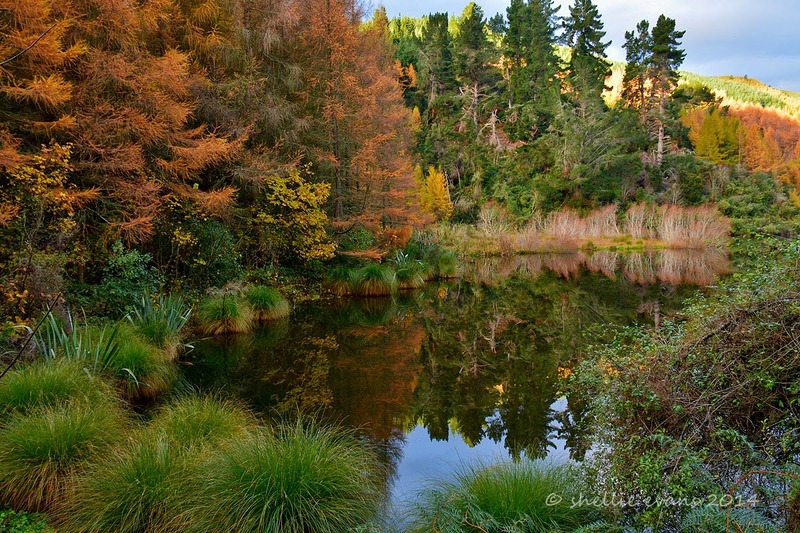 Gabriel’s Gully is named after Gabriel Read who discovered gold there in May1861. 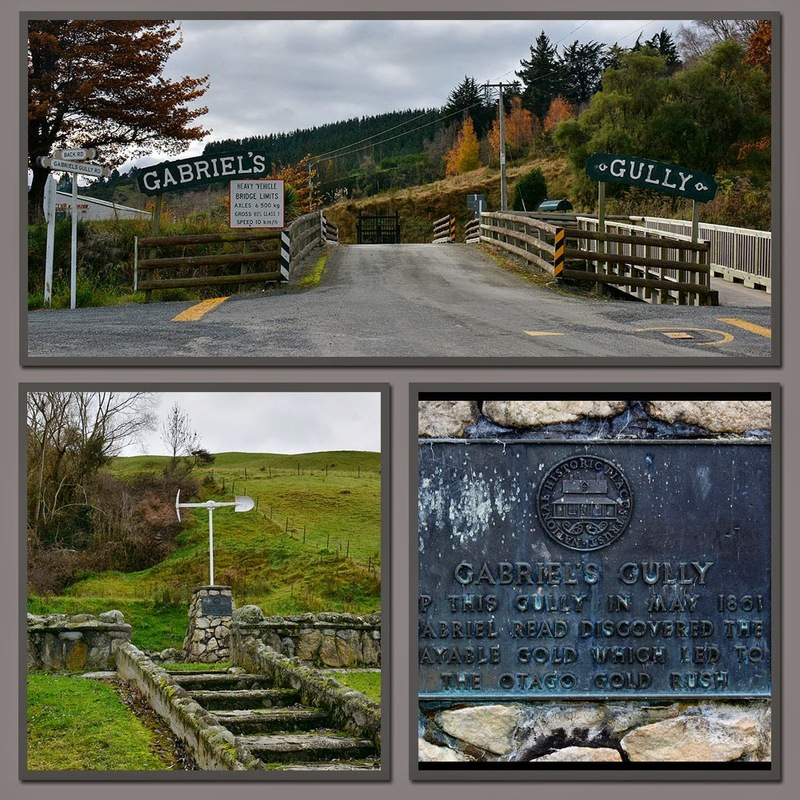 This was the beginning of the Otago Gold Rush, by July there were 150 men working the gully and by September over 6000 people were camped throughout the gully in amongst the diggings protecting their small claims. 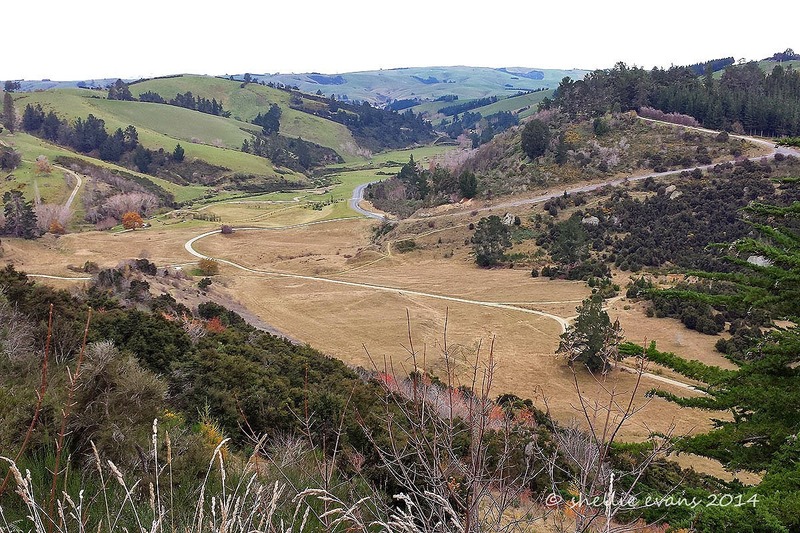 By the end of 1861 there were over 10,000 people on the goldfields, imagine 10,000 people, tents and dirt piles spread out down the gully shown in the photo below. Except that the valley floor is now a lot higher than it was back then. Water races from local rivers & dams (Grays Dam included) fed water into the area to wash the hillsides away into the sluice boxes to recover the gold. Gunpowder & dynamite were used to break up the rock. The tailings slowly filled up the valley floor. Across the gully and at the top right of the photo above is Blue Spur. 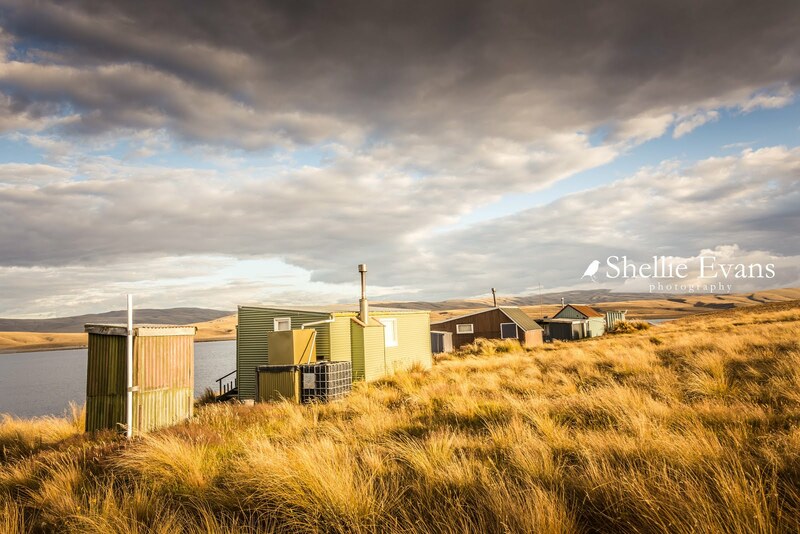 Blue Spur settlement was originally at the head of Gabriel’s Gully on the flat but when that ground was needed for mining the township was moved to the top of the ridge away from the flooding & mining. 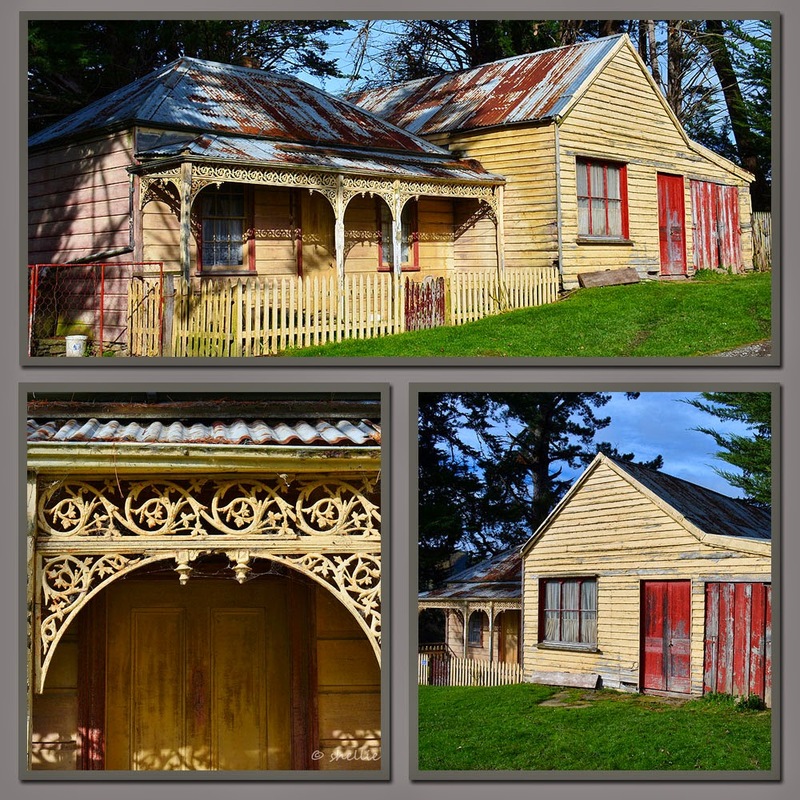 The town prospered from 1864-1868 with two of every type of store to service the miners, a school opened in 1867 (it was closed in 1925) and during the 1880s when Blue Spur had a population of 500, there were over 200 pupils & five teachers. Today all that remains of Blue Spur are these two buildings one a residence & one the butchers shop. Just one gully away from Gabriel’s was Weatherstons goldfield, discovered not long after Gabriels and claimed to have had more gold recovered in a four week period than Gabriels. Over 1500 miners flooded into Weatherstons within a few days which led onto Weatherstons being known as the gayest & noisiest town on the goldfields. It also suffered the fastest reduction of miners when news came through that gold had been discovered near Dunstan further inland. 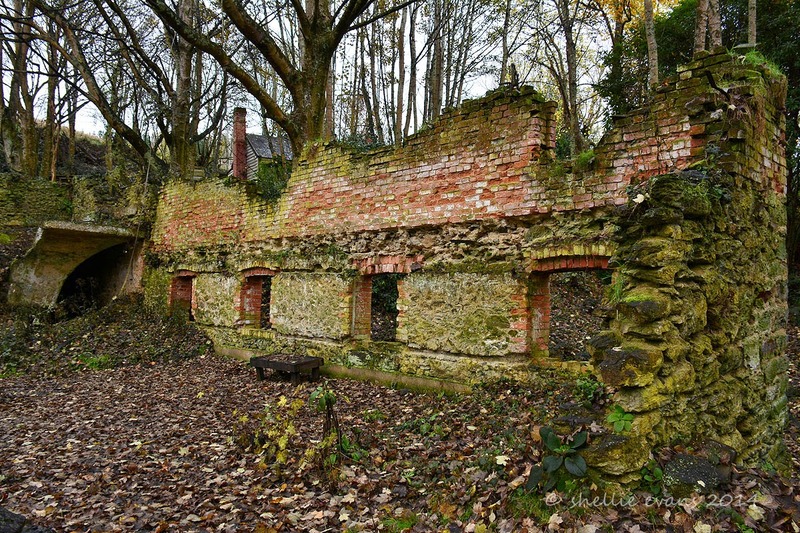 Today Weatherstons is well known for its mass plantings of daffodils and 100 year old rhododendron bushes along with the ruins of the 1884 Black Horse Brewery. The brewery was once Otago’s most successful provincial brewery and that was during prohibition. In 1923 the brewing rights were purchased by NZ Breweries, the brewery closed down & the workers offered work at Speights Brewery in Dunedin. 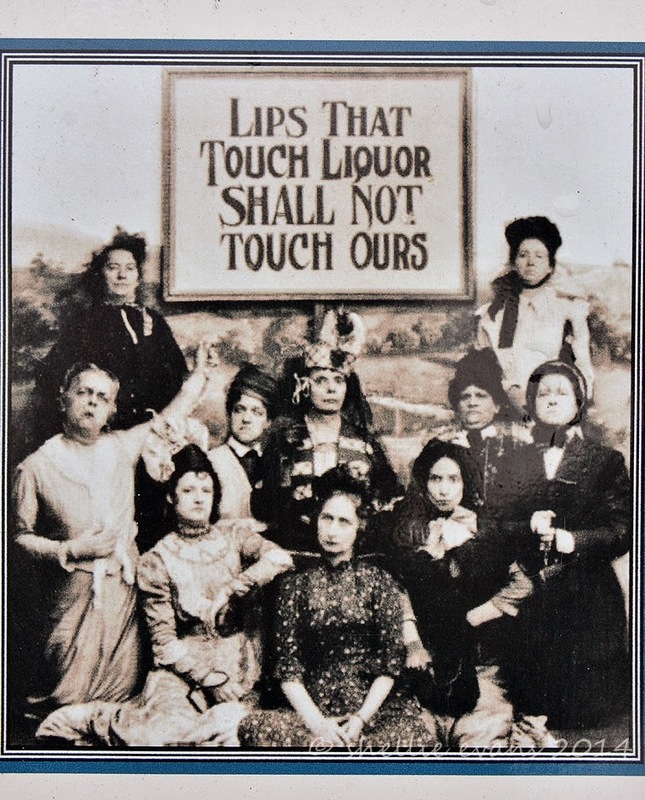 On one of the information boards was this photo of the ladies pushing for prohibition, looking at some of those faces I doubt anybody would want to give them a kiss anyway! The daffodils were first planted in 1895 and it was thought that over 1 million bulbs were planted during the first few years covering 10-15 acres of the hillside beside the brewery. No expense was spared and prices as high as £100 were paid for single bulbs from the Netherlands. Incredible when the average wage was only around £5. People came from far & wide to see the daffodils when they were in bloom, the flowers were also picked by school children & sold for charity. In 1912 the first train excursions from Dunedin arrived; 2 trains of 13 carriages each organised by the Dunedin Horticultural Society. In 2005 the daffodil fields were once again opened up to public display, the first time in 50 years. It's a pity we visited the ruins at the beginning of winter, the site didn’t look that attractive with bare trees, wet & muddy ground and overgrown abandoned buildings although the lovely red of the hawthorn berries added a bit of interest & colour. And I was finally able to grab a shot of another New Zealand native that not too many people would have seen or know about. This is a Brown Creeper (Pipipi- can you guess the sound they make?) 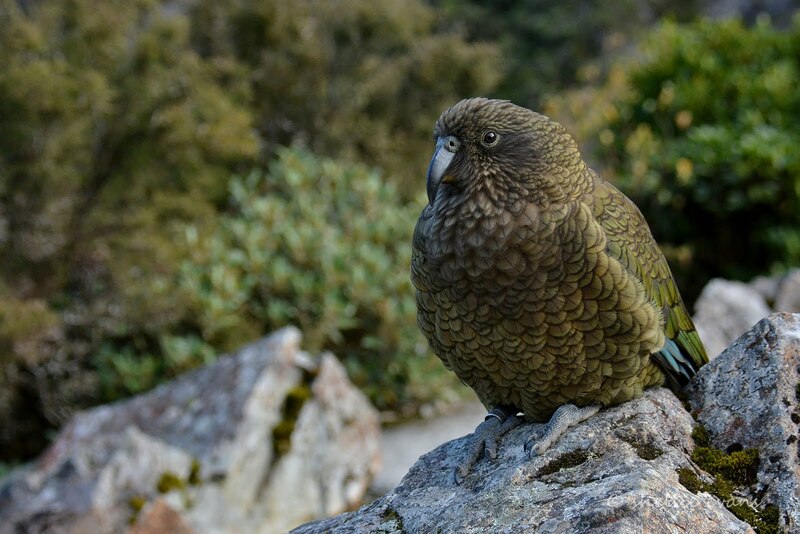 and they are actually quite common throughout the South Island but are very hard to see (and photograph) as they flock & move quite fast through the tree canopy feeding and calling to each other. Against the light of the sky they could be mistaken for sparrows. This isn’t a great photo but at least I have a record until I can get a better one! 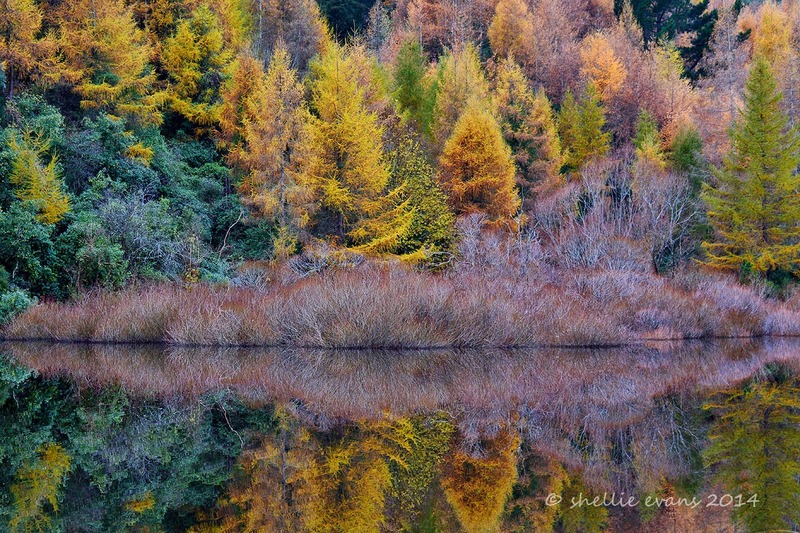 .......which actually replaced my Lake Dunstan storm photo!